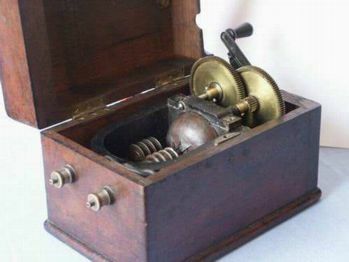 This is generator would probably have formed part of Evershed's Patent Testing Set (1900 pattern). 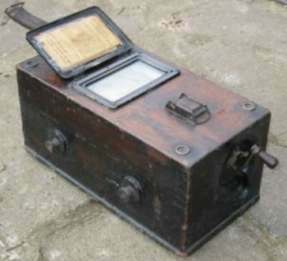 This model superseded the 1895 model and preceded the new model introduced in 1904 which had the meter and the generator in one box. 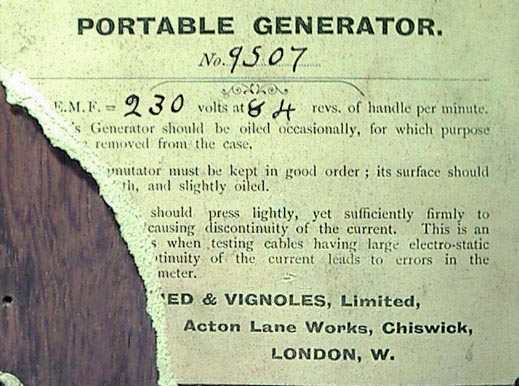 The generators were also made for firing electric fuses. You can read the Evershed and Vignoles publicity material describing the 'new' 1900 pattern testing set of the time here. 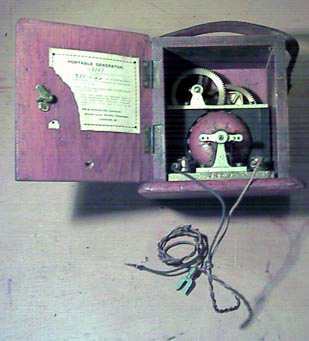 Clive Jackson has provided a description and pictures of a similar but smaller item used to test cable insulation. 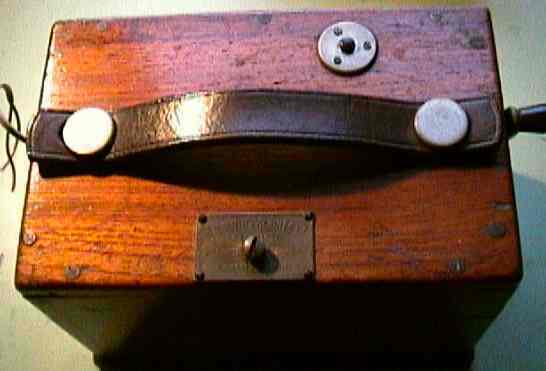 It measures 7" tall and is 6 1/2" by 6 1/2" in plan and also is housed in a polished wooden box with leather handle. Inside the door there is a fixed piece of card (Unfortunately a corner was torn off by his children some years ago) giving technical specifications and instructions. Evershed and Vignoles relocated their works to Acton Lane in 1903, so although this is a 1895 pattern it must have been made after that date. 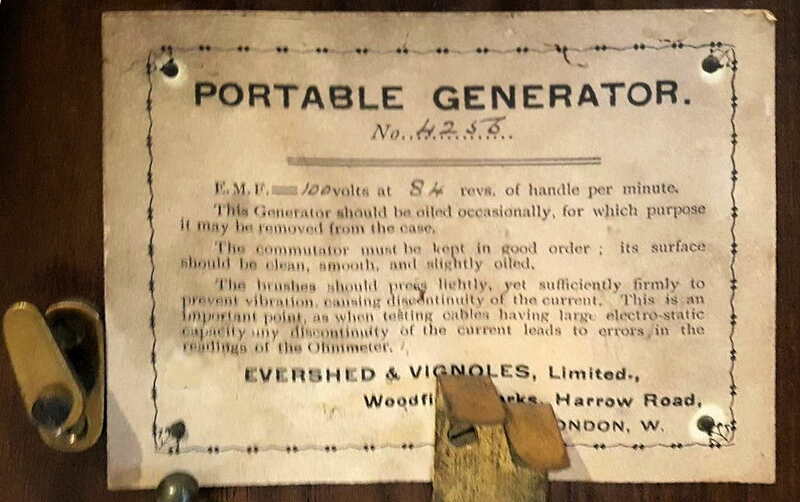 Evershed's 1895 pattern portable generator. 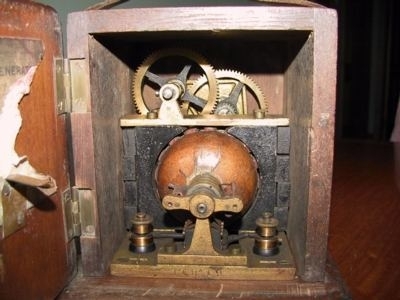 The intended use for Clive Jackson's generator shown above is shown and described in "Instruments of Science: An Historical Encyclopedia" by Robert Bud and Deborah Warner (01 December, 1997) - Garland. 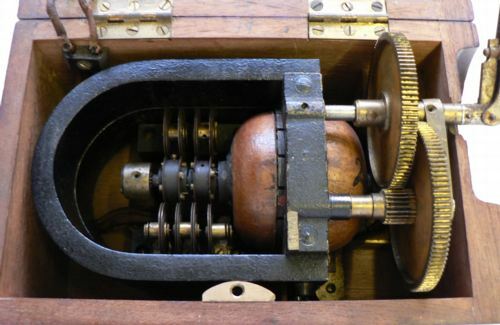 The generator was originally designed by a Mr Goolden of Messrs. Easton, Anderson & Goolden and the generator was used separately from the instrument itself to obviate interference by the permanent magnet fields of the generator. Evershed Vignoles then took over the manufacture. 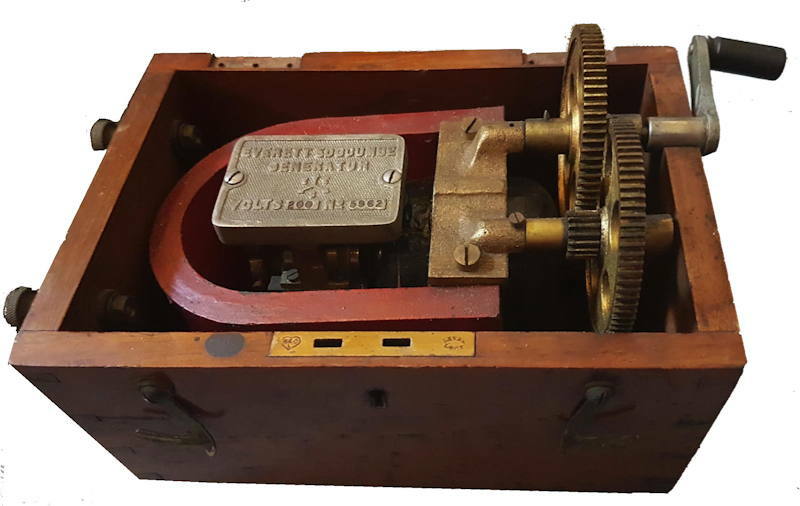 On p.89 of Sir David Salomans' book, 'Electric Light Installations, Part 3' published in 1894 there is a picture of such an instrument and its hand generator connected by 'curly' single conductors rather than the self-coiling cable reel which my item has. 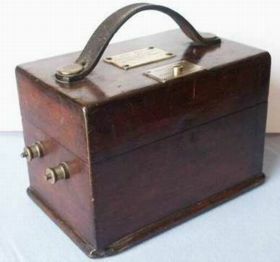 I have "Direct Current Electrical Engineering" by JR Barr published by Pitman 1908 Which describes "..........Sidney Evershed's ohmmeter or 'Megger'...." This is a combined instrument, the generator and the meter sharing the same magnetic field. Although there is no picture of the construction this would seem to refer to the model first made in 1904. Francois was searching information on the web about a hand generator when he came across this page and found that he had one which was very similar. The label on his reads: "Evershed & Vignoles Ltd., London, No. 12867, Patent, 200 volts, 100 revs". There are several Villages /Towns called Crook, but Crook, County Durham has a Grey Street and is not too far from the lead mining area in Northumberland. Martin is quite a common name in the North East of England. Jon Clafton has a 200V generator (serial number 17465) identical to mine. The rotary flex 'dispenser' is in perfect condition and the entire device works perfectly.His still has the original cable and fitted connectors. He also has another generator (serial number 18550), similar to the 200V one, but that one simply has two output terminals, and is 20V. He also has four Evershed & Vignoles megger insulation testers similar to the one featured below. These all have the original date on the underside of the lid. The oldest one he has is dated 1912, and the newest is dated 1920. 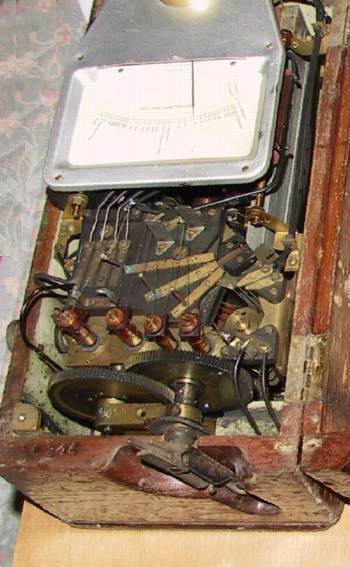 Jon Clafton's old generator and an accompanying ohmmeter are shown below. 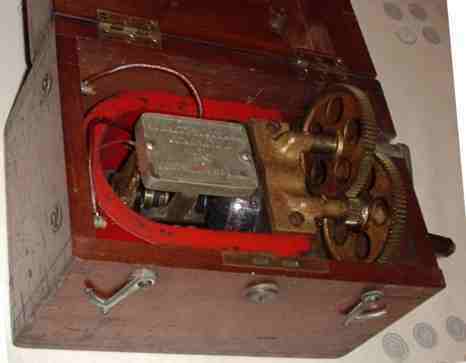 He thinks the generator was made in the late 1890s and the ohmmeter the early 1900s. These are the instructions printed on the lid of the above meter. 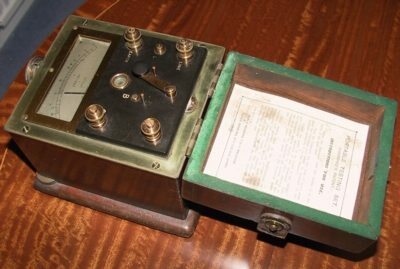 William Edward Ayrton (1847 - 1908) English engineer and inventor, with his colleague John Perry (1850 - 1920) invented many electrical measuring instruments and coined the the words 'voltmeter and ammeter'. In these, use was made of an ingeniously devised flat spiral spring (as used in modern analogue meters) which yields a relatively large rotation for a small axial elongation. They also invented the principle of moving a pointer by the combined fields of separate voltage and current coils thus enabling power or resistance measurements to be made with only one instrument. They used fixed coils at right angles to each other and there was a magnetised needle at the pivot end of the pointer. There was no problem with coil connections since they were fixed and then as now, there was no control spring. The needle doesn't come to zero until the test terminals are shorted and the generator operated. Evershed & Vignoles tidied things up. They made a double moving coil,one for voltage and one for current. They were fixed together, but not at right angles. 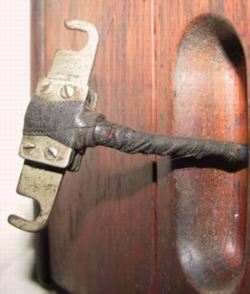 The pointer was fixed to the coil assembly and the coil connections were ligaments, no hairsprings since the only influence on the coils was that of a powerful permanent magnet. This got over the gradual loss of magnetisation which the Ayrton and Perry instrument suffered from. 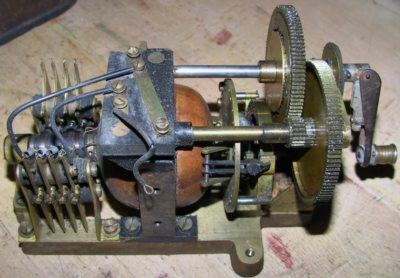 It also enabled the generator and meter to be combined into one instrument as it was no longer necessary to obviate interference from the permanent magnet field of the generator. The earlier instruments had two massive bar magnets with pole pieces at both ends, so that one end did for the moving coils and the other provided the generator field.These two pictures from Jon Clafton show the general construction and the second the generator without magnets and meter movement. 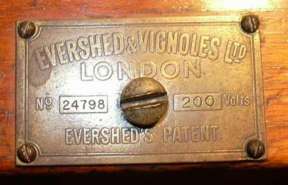 Evershed's patent. The answer to much of the speculation above is revealed in the US patent 639849 a small part of which is reproduced here. 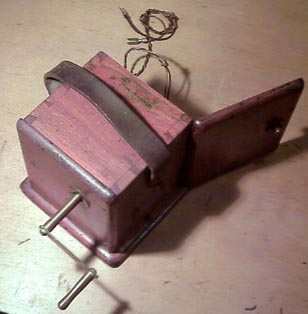 This invention relates to portable hand dynamos, such as are used for testing purposes or for firing electric fuses or the like purposes, where a small current t of high electromotive force can be utilised; and it consists in an improvement whereby the frictional resistance to rotation (of importance in such small appliances) is reduced to a minimum both in the armature-bearings and in the commutator, the current is collected with highest electromotive force, the hand 'which is made collapsible when not in use and is then in a protected position, and connection to any instrument or object, at a reasonable distance from the generator, is rendered easy and rapid without the use of loose wires, which may be mislaid, and without any binding-screws projecting from the portable box containing the dynamo. 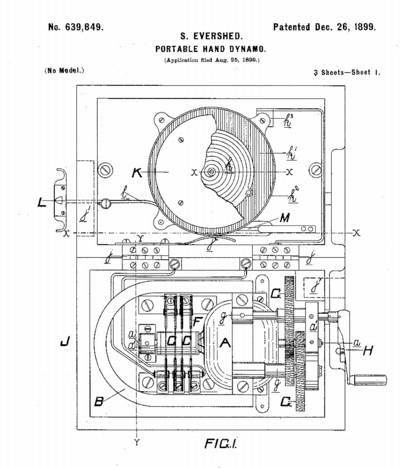 Figure 1 is a plan of the box, with the lid open, containing the dynamo in the body of the box and the winch-handle ready for operation issuing therefrom and the connection device in the inside of the lid." The firm Megger Ltd. https://uk.megger.com is now based at: Archcliffe Road, Dover, Kent, CT17 9EN, United Kingdom.